Tumble dryers are a common appliance in many homes, but not everyone uses one - some people might prefer to have a combined washer drier or save space. And it's certainly more energy efficient to simply hang your clothes out to dry. Whatever your preference though, this product group has perhaps undergone the most interesting changes among large domestic appliances over the last 5-10 years, in terms of the technology and their energy use. So what types of product are out there? Should you upgrade an old tumble dryer? Are the savings worth it? We'll answer these questions and more in this section. 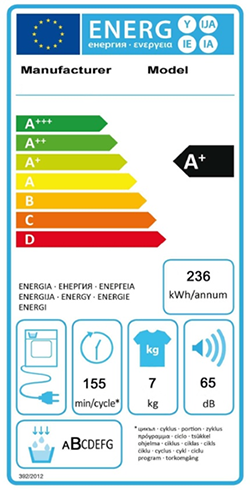 The current minimum energy rating of condenser dryer that can be sold is B - the best standard condenser dryers on the market can achieve this, but the best heat pump models on the market at the moment are A+++ rated. C-rated vented models can still be placed on the market. For the most efficient models, look out for the darkest green band. Also, consider the size you need - if you're a smaller household, a 7kg model could serve you needs better, whereas a 5 person family might benefit from running a larger model less often. 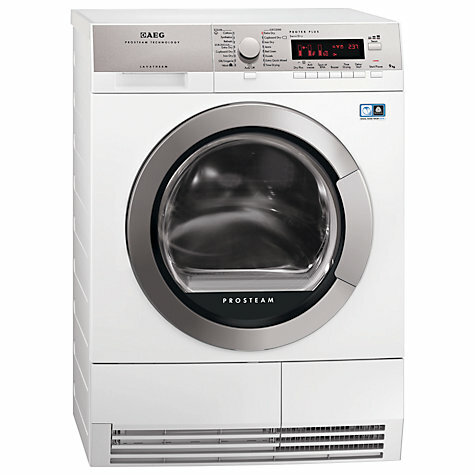 What types of tumble dryers are available? There are two main types of technology used in tumble dryers – vented tumble dryers and condenser tumble dryers. Vented (or ventilated) dryers collect the steam generated by the drying process and vent it out through a hose. The vast majority of vented tumble dryers are electric, but there are some gas-operated models available. Vented tumble dryers need to be positioned near a window or door to release the damp air away from indoors. Condenser dryers remove the moist warm air generated in the drying process from the drum and cool it inside the machine. The resulting water is collected in a removable reservoir. Condenser tumble dryers can be installed anywhere because water from the drum is collected, but the reservoir needs to be emptied regularly. Poorly designed condenser dryers may release steam into the surroundings and cause damp. Heat pump dryers are currently the most efficient technology on the market. They work according to the condensing principle above, but use a pump to retain the removed heat and use it to warm up fresh air entering the dryer. As a result they work at a lower temperature than non-heat pump condenser models, although they may take longer to dry the load. Heat pump dryers are also more expensive, but prices have dropped in the last couple of years, with a number of very efficient ones costing around £500. The Energy Saving Trust estimates that an average household does five washes per week and spends up to £130 a year to keeping their clothes clean – and this does not include the cost of detergents. Spin to the max. Spinning your clothes on the washing machine’s highest spin cycle will remove as much water as possible, so they will dry more quickly in the tumble dryer. De-fluff your dryer. Make sure your tumble dryer’s filters are fluff free. It will help it to dry energy-efficiently. Reduce the load. Sort out the washed clothes to make sure only the ones that need to be tumble dried get included in the drying cycle. Pop a ‘dryer ball’ in the tumble dryer to separate clothes. This allows the heat to circulate better and helps to dry clothes more quickly. Dryness sensor feature. Dry clothes for ironing together with other clothes. Start the load with an iron-dry setting, remove the clothes for ironing, and then put the rest on a cupboard-dry program. Cut down drying time. Don’t dry for longer than needed – it wastes energy. Make sure that the machine is turned off at the socket when not in use. Dry outdoors. Save energy by drying clothes outdoors on a clothes line wherever possible, even on dry winter days, rather than using the tumble dryer. Your clothes will feel and smell fresher too. Plan your ironing to avoid changing the heat setting of your iron. Start with clothes that need a lower temperature. Finish with clothes that need the hottest setting. Switch off appliances completely rather than keeping them on standby when you've finished using them. Keep large appliances away from each other. Putting your tumble dryer next to your refrigerator will make the fridge work harder due to the heat and moisture coming off the dryer.